Fifty years ago, Sister Kikyo sealed Inuyasha on the Tree of Life. Inuyasha... my sister took the Sacred Jewel... but did she look so peaceful when she passed away? Let's stop fighting... Be a real human. You want me to become human? 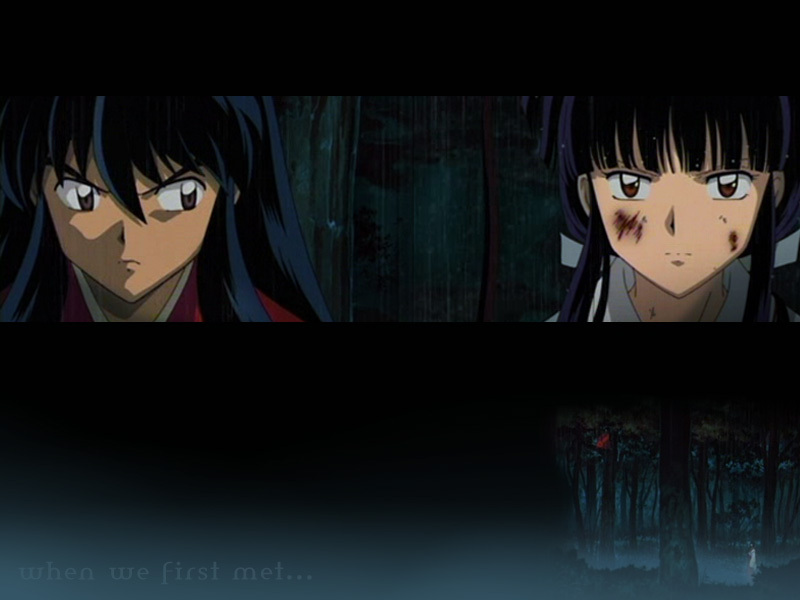 Next on Inuyasha, "A Fateful Love Song of Before We First Met". That was the first time I'd seen the Sacred Jewel. And... after she was given custody of it, Sister Kikyo's fate changed drastically. She would watch other girls her age indulge in make-up, paint their faces white, and enjoy their lives with vitality. I've purified the Sacred Jewel. As long as I am protecting it, you won't get your way. Dont' make me laugh! Your whole body reeks of demons' blood! (...) I'll definitely find you not matter where you are! With your intolerable stench, it's easy enough!! My mother only left me this and the Fire Rat Robe. Your mother was human, wasn't she? I don't mind. The Fire Rat Robe is good enough for me. "Beloved" sounds good... for the subjugation command. This is the first (and perhaps only) time we hear someone other than Sango wield Hiraikotsu. KAE: Everything began fifty years ago. 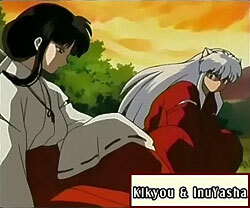 Sister Kikyo and Inuyasha... The love song of their tragic fate. Rumors has it that a holy person, Hijiri, defeated the demon birds and protected a village. Hakudoshi, after hearing word of this, is making his move again. Those villagers, frightened by the demon birds, gathered around this Hijiri, treating him like a saviour. Right now, Princess Abi is bringing her demon birds to this village where the holy person is. Even Inuyasha's red Tetsusaiga can't defeat Hakudoshi! Just at this moment, a Sacred Arrow appears and broke the barrier! Next on Inuyasha, "A Single Arrow Calling Up Trouble".